For followers of our Tesla project, I apologize for the long hiatus. We will be continuing with the design of this set. I would like to quickly review the set concept so far, and then talk about the steps that lie ahead. The one thing we know for certain about Tesla is that it's a world with advanced technology, and many versions of the world were proposed around this aspect. The type of tech might be futuristic technology, steampunk technology, or magitech, or it could be a post-apocalyptic world where technology must be salvaged from the ruins. As for the civilization of Tesla, it could be an advanced society that developed within an environment that was previously devoid of mana but is now experiencing a resurgence of mana, plunging it into a conflict between those who welcome magic and those who reject it. It could be a factory world — either the Dickensian Industrial Age kind, or the clockwork kind operated by brass gnomes and wind-up animals. It could be a Pacific Rim world under attack from invaders, constructing giant robots to fight them off. The world of Tesla doesn't have a full-formed identity yet. We'll need to get to that, and I hope to be holding discussions for that on this blog at a later stage. But first of all, we need to do more testing on the Mecha mechanic, since it's one of the few tangible mechanics that solidified out of the ideas above and is a big part of the reason that this world was chosen for the project. 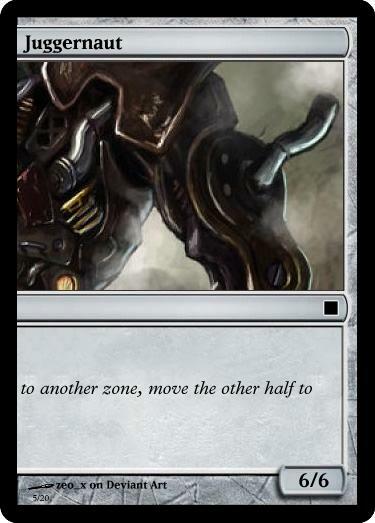 For those who weren't following the project previously, the Mecha mechanic uses a type of Dual-Faced Card where the flipped sides of two cards can join up to form one creature. There is a chance that this direction will not pan out (I can see a few difficulties with it), but we need a mechanic related to technology that is proactively fun and satisfying to do (i.e. not just related to the payment of costs) and at the moment it seems to be one of the best leads we have. We will need your feedback on this mechanic, both for iterating different executions of the mechanic as well as for making the decision to proceed with it or not. I hope you can join in on one of the playtests because any feedback you can give after you've tried playing with the mechanic would be especially valuable. I'll be posting the details of the testing in a later post. I hope it will be fun. We need to test drafting this set first to find out the right number of Mechas to include in the set. While most set designs probably don't start out with draft tests, it's something that Wizards R&D did with Return to Ravnica block design in order to find out about the necessary draft logistics and block structure right at the beginning. The reason we should test this first is because Mecha is a mechanic that simply doesn't do anything unless you have a critical mass of it in your deck. More than any other mechanic, its balance and fun-level relies on having the right level of availability. If we don't get the number of slots right, I don't think it can be adjusted for by tweaking the costs later, for example. Due to the way that the printing of Dual Faced Cards work, the number of card slots for Mechas will probably have to be a multiple of the Innistrad numbers. 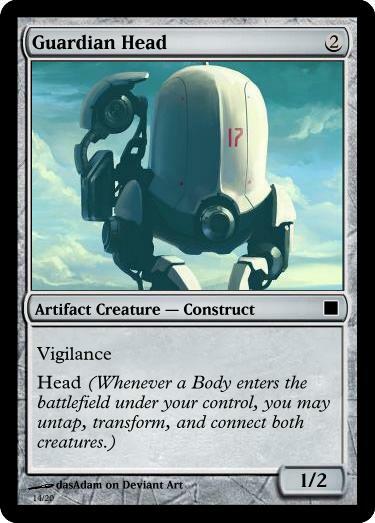 Innistrad had 6 DFC Commons, with one card in each pack, so for Tesla, the number of Common Mecha cards has to be 6 (one per pack), 12 (two per pack), 18 (three per pack), or some other multiple of 6. As you can imagine, a set with 6 Common Mechas and a set with 18 Common Mechas are going to have very different set structures. That would have a big impact on world building and what the set is about. 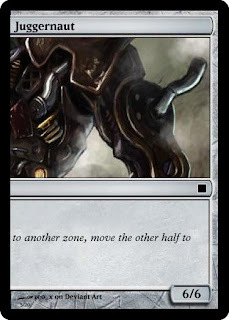 For example, if the set has a large number of Mechas, we might want an equally large linear faction to serve as a counterpoint to the Mechas, which would lead to a dual faction set like Kamigawa or Scars of Mirrodin where you have two sides fighting each other. The story in that case would need to depict this war between two sides. So to summarize, the number of Mechas isn't a flexible constraint, and that number will influence the set structure and set identity, so we should work it out first. As we test the number of Mechas, we should try both colored Mechas and colorless Mechas to see which style better facilitates drafting a Mecha deck. Colored Mechas could make it easier to draft the Mecha deck since players can try to gauge which colors are open and stay out of each other's way. Or, it might make it harder to draft because there will be less total Mechas that can go in your deck due to color constraints. We need to find that out. Once again, this is another constraint we need to know about early because it affects the set's identity. For example, if Mechas are colored, maybe they can be concepted as Magitech vehicles powered by magical crystals. That would help distinguish them a little more from Mirrodin's golems, but would also require a different type of back story than Magic vs. Technology. To do this test, we will need to mock up a draftable set. I think the quickest way to do this is to insert the Mechas into an existing set. A good candidate for this is Mirrodin Besieged since it contains a lot of artifact support cards already. Also, I believe the testing would work best if there is a competing linear strategy like Infect to draw players into a direction other than Mechas. Infect also has the chance of creating interesting matchups against Mechas since the mechanic has the ability to combat gigantic Mechas without killing them outright. Then again, they might shrink the Mechas too quickly. We're not locked into Phyrexians and I hope to alternate the type of villains we use in each test to find out what kind of opponent produces an interesting battle with Mechas. Your contributions will be valuable here too. The application we'll be using is called Lackey CCG, which is a tool for playing and testing card game ideas online. The testing process will probably take multiple weeks, because we need to try different configurations and we can realistically only hold one large playtest session per week. But as we go along, I hope to hold design challenges on this blog on other days of the week for tasks such as creating Mecha support cards and villain factions. After we determine the numbers for Mechas, their color identity, and whether or not to proceed with them, the next step would be to choose one of the possible identities of the world that we've talked about and settle on it, using the test results to guide us. (New suggestions will be welcome too.) Currently, we haven't left Mirrodin-land, but we need to establish a definite identity that sets Tesla apart from Mirrodin the way that Ravnica's guild theme set it apart from Invasion's original multicolor. Thanks for reading and/or contributing, and if you have any comments on how we should proceed, I would love to hear it in the comment section. Mirrodin Besieged makes sense as a starting point for this targeted test, except that it's a small set and lacks a number of the 'boring' staples that make Limited work, like Naturalize. 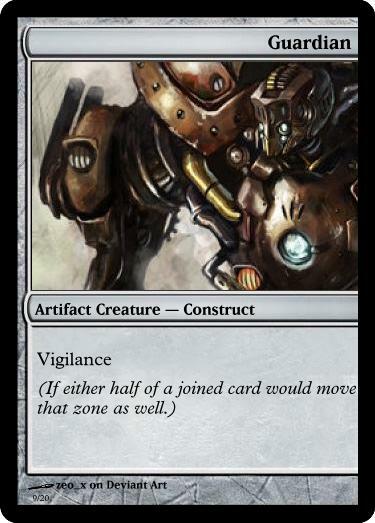 It occurs to me though, that instead of replacing cards, we could just add in the mechs and a few such workhorse cards. We absolutely should test and decide based off of that, but my guess is that we do want most of the mechs to be colored cards, and that we would rather have slightly too many DFCs per pack than way too few (2 or 3 vs 1). My understanding is that they put one DFC in each Innistrad pack because they had to be printed on a separate sheet and it was prohibitive to collate them with the other rarities. They did mix DFCs with SFCs in the foil slot though, so it is possible. I'm thinking matching rarity was the logistical deal-breaker. Right, I was beginning to make a mockup set for the draft by choosing a few replacements here and there. I found that it is a fun process though, and I'm thinking of collaboratively making a mockup draft set here over the week. If we mix DFCs and SFCs, we can adjust the number of Mechas more flexibly. While it won't be guaranteed that each pack will have at least one Mecha, it won't be much of a problem if there are an average of 3 or so per pack. I think the combo cards are super cool. I'm not sure if they will work to any degree but they certainly got the wow factor down. 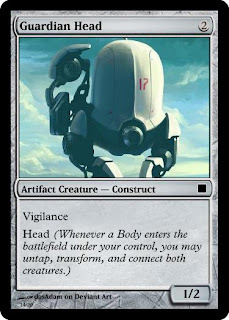 Do you want constructing a mecha to be an reasonably common occurrence in draft? Cause this implementation doesn't make that likely. Assuming our player builds a deck with 3 heads and 3 bodies, what are the odds that she will get both a head and a body by a given turn? Let's assume for the sake of discussion that the player will hit all of her land drops, and each game lasts to 7 turns, and there's no removal. Our player will get to play 3 matches, each of which will average 2.5 games = 7.5 games. In each game she will have a 49.5% chance of successfully assembling a mecha = 3.71 mecha assembled per tournament, which means that *the player who drafted mecha* will only get to actually play a mecha roughly 4 times the entire night. And that's assuming no one uses removal to take out one half of her mecha in response to her playing the other half. Not that this refutes anything you've said, but if we were to conceptualize the successful construction of a mecha as being more equivalent to casting an Eldrazi — rather than equivalent to flipping a DFC — the lower statistical odds of achievement would be more sensible. An excellent probabilistic analysis that supports the both putting more than one DFC in each pack, and making colored mechs. If they primarily appear in two or three colors, like Werewolves did, you'll usually only have two players trying to push that strategy in a draft pod. One option is to make the 'heads' colored and the 'bodies' colorless. It makes it super obvious which set of cards combine with which, you can concentrate the Mechs is a few colors, and you make sure that whatever 'bodies' the Mech player picks up they can play. The Heads and Bodies can be reconcepted as Pilots (colored) and Vehicles (colorless artifacts) to make the combinations more intuitive. The difference is dramatic. I'm still thinking about what the right takeaway from this data is, though. Realization: twice the DFCs require twice the checklist cards. Thanks, Evan. This math is very useful. We need to use as much math to narrow down the configurations we test. Also, any single test we do is affected by variance and is inconclusive, so we need math to put our games into context. My initial guess was that we'll need 1 head and 1 body per pack, and these numbers are heartening. However, this 2nd chart does assume Mecha players will be playing 6 Heads and 6 Bodies in a deck, which means 12 out of the 14-17 creatures in the deck will be Mecha parts. Considering the French vanilla feel of Mechas, this could mean the decks are going to be very monotonous, which might be a problem. I think the math could change if there are cards that tutor for either a Head or a Body. Part of the reason it's so hard is because you need the right type. When we say colored Mechs, are we talking all 5 colors? Could be like M14 Slivers, where they appear in all colors, but are only common in some. I have a different argument in favor of colorless mecha. To me, the best thing about mecha is the unpredictability of the robot you build. If they're colorless, then you dump all of them into your draft or sealed deck and see what combination comes up. If they're colored, then some combinations will come up much more often than others: Firebreathing Head on Hasty Body, etc. Replace "mecha" with "cards" and "robot" with "deck" and you have an argument against different colors of cards in the game. If all cards were colorless, the same best cards would always get played, and deck variety would decrease. If all mecha are colorless, you don't just play your best few. You still play all of them, because transforming mecha is a big bonus. This will likely be determined by whether it's in the best interests of the format to have more defined paths for drafters to take or whether it needs that additional level of open-ended modularity for higher level players. Obvious best-combinations are obviously not ideal, but neither is option-paralysis before a match ever begins. I personally don't like environments where going into one color like White always means going into a specific color combination like White-Blue. I think it's Scar of Mirrodin's biggest fault. If there is a strong linear theme in one color combination, I believe there should be an equally strong linear theme in every other color combination, like they did with Modern Masters. Mecha is probably the most Linear mechanic we've seen so far (not counting something like the Tome Scour deck or Pestilence Rat deck that isn't expected to work). You need to pick up more than 6 Mecha pieces to even have a shot. Imagine if Limited Sliver decks were a failure unless you had 7-8 copies, minimum. I don't think it's feasible to give each color combination a theme that is Linear to that extent. Agreed. One option is to include tons of mechs, but make most of them fine creatures on their own so that players don't end up with unplayable decks when they don't come together. The issue being that the lower opportunity cost means that we wouldn't get to make the assembled sides as impactful. Maybe you play this 2/3 for 2W and this 2/1 flyer for 2U and in one game during the night, you get both at once and flip them into a 4/6 flyer. If seven players are doing that and one is trying to force the mech archetype so he can flip all night long, that sounds fun and reasonable. I disagree. It feels much worse to play a 2/1 flyer for 2U that you will never flip than a French vanilla. During the earlier playtest, it felt very bad to play something like a 1/2 lifelink Head or 4/1 Body without a partner. (Although I don't actually remember which exact ones I played.) Those guys can't attack very well, and I don't want to trade them away because I'm waiting to draw its partner. The 2/2 flyer Body was better because it had something to do while it was waiting (attack), and the 1/4 Body could block until I draw a Head. I think it's worth it to make the other Parts useful on their own like that too. It might mean non-Mecha players will pick them up as fillers. For those players it will only be an occasional miracle moment to get to combine them. I see that it's not ideal that a card has an ability that isn't always used. Beginners frequently feel bad about playing cards with abilities they won't use even if the stats are actually good. But then again, you will have Miracle cards you didn't get to Miracle-cast during a draft tournament, or you will have Megantic Slivers that you didn't pump anything else with, and they're not that huge of a problem. Catering to the needs of the Mecha deck seems like a higher priority than reducing those moments. Even in the Mecha deck, no matter how much support we give them there will be many times that the Mechas don't combine. I think the problem of them having low utility on board was less visible when we played a same-deck match in the playtest because neither side was under pressure due to both sides playing these 2-drop 1/2s. When we put them in a set containing other strategies, though, I feel the Parts should be useful on their own. What if Mecha don't combine from play, but instead combine from the graveyard? That changes the mechanic from a risk of card disadvantage into free card advantage. It also means you don't have to spend five turns saving your 4/1 hoping you draw a partner and can instead swing and trade happily while you wait. The main downside I see is that you might have the part you need still in play and your opponent won't kill it; but A, that means you've got leverage, and B, we can include sacrifice effects. Possibly alongside scrap tokens. That is something we should definitely try out. It would belong in a world setting where you scavenge the ruins to gather parts and cobble together a machine. If Mechas combine from the graveyard, I guess you exile both halves when it dies to prevent infinite reanimation. Another style of assembly is if you play one half from hand and you "salvage" the other part from grave to "augment" it. I think it would it would be good game play that way. However, I'm not sure how to handle zone movements like bouncing to hand. I guess both halves bounce to hand but then you can replay each part to recover more stuff? This conversation is making me realize that while we can learn from the testing, we'll never get the numbers right while the mechanic itself is changing. A grave version will be much more resilient and require less numbers. Scrap tokens seem like a bad idea to me, at least the iterations I've seen so far. It seems like a plan to have tokens that do nothing, which is boring in itself, and then try to make those thing important by introducing lots of cards with the text "sacrifice an artifact" which is neither new nor something players particularly enjoy. What's cool is the act of making a new machine out of scavenged parts, and we should be focus on that "making" part and the cool product you get from it rather than focusing on the scrap pieces and trying to make them important somehow. Scrap doesn't need to be physically represented; it seems enough to exile an artifact from the graveyard for example. If we were to have a parasitic commodity represented by tokens, I would rather have something like Fuel tokens or Ammo tokens. Maybe there is some cool way to do Scrap, but having ability-less tokens and cards that reference them is not the way to go. I'd like to know what you think is cool about Scrap though. The only reason I mentioned scrap tokens was that if we're going to make a bunch of "Sacrifice an artifact" effects to help players get their DFCs into the graveyard when they'd rather flip them into mecha, having other uses for those sack effects would be a combo. Nothing says scrap tokens have to do nothing. Scrap tokens could be Parts tokens, for instance. The current conception is that heads grant abilities and bodies give stats. So how are we supposed to make exciting rare bodies? We could just stick abilities on those too, but then they start to lose identity. Currently I'm thinking triggers when they combine so they can act as virtual "virtual vanillas." We do have one body with flying so far. I think it would make sense if bodies could had abilities related to locomotion like trample or vigilance. Maybe the bodies have the stats and keywords, while the heads have all the other rules text: trigger abilities, activated, static, etc. Having triggered abilities and activated abilities on higher rarity Mechas would be cool. For reference, M14 has 7 common sliver cards and 3 uncommons giving an average of (7/101*10+3/60*3)=0.843 slivers per pack, and 20.234 slivers per pod. This is just enough to allow one drafter to be a "sliver deck" (and only if they run all 3 colors). I think we probably want ~3 mecha players per pod, which would be best at 60 total. I feel like we want between 2 and 3 mecha cards per pack. 3 means there will be 72 parts per pod, 2 means 48. If we're aiming for 60, the former is too high, the latter is too low. 1) Have 3 parts per pack. 3) Have several of the parts have high-pick front-faces (like the vigilance sliver in M14) and relatively low-powered back-faces. 4) Have the colorless parts have weaker front-faces (to allow them to get to the mecha drafters) and thus correspondingly better back-faces. An alternative route would be to have a guaranteed head and body each pack, then have the last slot be 50/50 a mecha part or another double-sided card. There's no reason all DFCs need to be mecha after all, right? That would fix the numbers issue nicely. With such a linear mechanic, it needs a lot of support cards. Blue and Red will want more looting than usual, green needs Ancient Stirrings (or a similar card), black should probably have some sort of a tutor at uncommon, and we can include several colorless spells that help find them. Just thinking, Transmute or Transfigure would fit perfectly as a mechanic if we want to help increase the probability of assembling a mecha. Put enough support cards in and we could safely drop the Mecha/pack down to two which would probably be a lot easier logistically. Lots of great stuff here, Notgreat. The only assertion I take issue with is wanting 3 mech players per pod. That's nearly half. If one Sliver player per pod works for M14, and one or two Werewolf players per pod worked for Innistrad, why do we need so many mech players for Tesla? If it's a dual-faction set, the way Mirrodin had you going after Metalcraft or Infect most of the time, 2-3 players for each side (with other players playing goodstuff decks or marginal strategies) might not be too much. I like the idea of the colorless part being weak on the front and strong in the back. Maybe it could be something like a 5-drop 1/1 indestructible body that becomes a 4/4 indestructible when flipped? Tutors and sifting cards are tricky because too many of them can make bombs too good. I'm not sure if we want the exact mechanic of Transfigure because we don't want the tutoring to be limited to Black and Blue, but it's still a good example to raise in the sense that it's a narrow Tutor and doesn't just fetch any bomb. I hope we can come up with a narrow Tutor like that. Another type of support we need is graveyard recursion, especially the type that returns two creature cards like Morbid Plunder. I'm nervous about tutoring as a set mechanic. Transmute slowed games down and decreased variance. Making colored DFCs decent in front and colorless DFCs weak in front sounds very promising. A bomb head that searched for bodies has a lot of potential (unless we find that we potentially want that at uncommon to push the archetype). An *actual* bomb head that explodes on impact would be fun too, but isn't too relevant to the discussion. Nice. 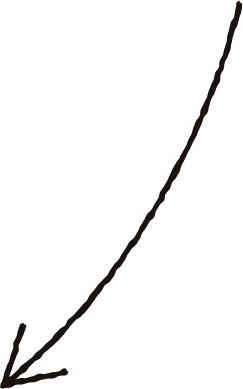 It could be a Head that searches for a Body when it successfully hits the opponent. Also, a bomb Head that explodes on impact, doing a self-Fling to an opponent? Teaming up with a 7/4 body? "[COST/TRIGGER]: Search your library for a Head card, flip it and CARDNAME, and assemble them." If we have the search on the bodies, we need to have a roughly even powerlevel in terms of heads since otherwise you'll just always pull out your best head. While it's a fine idea to let some higher-rarity heads/bodies search for their counterpart, I don't think we want that at common. I think 3/pod is the right choice if we want it to be both a highlight of the set and in all 5 colors. That way, every color will be taken by someone, and you can still build a reasonable 2-color mecha deck. I think at this point the best thing to do would be to flesh out the world some more, and make some other mechanics from that. I feel like if we try to make it a big 1v1 battle it'll feel too similar to the recent Mirrodin set. What do you think of having it be a 1v1v1 conflict? On one side, the mecha assemble. On another, the great magisters form massive spell chains designed to eliminate armies. Finally, the ancient tribes have banded together to fight off these strange new enemies. As long as you can pay the mana you can keep casting it, but once you can't, the chain falls apart. This would be for the ancient people, and it would also allow them to make big giant monsters to better combat the mecha perhaps? The removal in Rise of the Eldrazi like Heat Ray, Vendetta, Domestication, Inquisition of Kozilek, etc. are a good model for removal that doesn't kill fatties easily. But we definitely need to consider a version that doesn't create card disadvantage too. I like the idea of each 15 card pack having a DFC Head, a DFC Body and a random 15th slot that could be a token card, ad card, foil card or regular DFC card. We will need a Checklist card just for Heads and one just for Bodies. They should look very distinct from each other, especially if we transfrom one of more parts from the graveyard. I'd like to see parts be a mix of colorless and colored artifacts. This allows us to make some generic front side parts (with flying for example) at Common/Uncommon while also having front side parts (with deathtouch or double strike for example) at Uncommon and Rare. 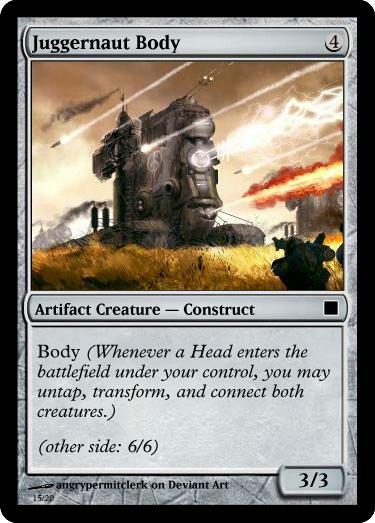 I love the idea of Heads having transform, attack, etb triggers and Bodies having keywords. Each part should feel very distinct. 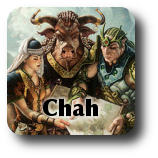 You want players to say "of course that does BLAH BLAH, it's a Head part." I agree that tutoring in the set should be low, but I'd like a pair of creatures in Mech support colors that search up Heads and Bodies, similar to the way Anarchist and Scrivener recovered Instants and Sorceries in Odyssey Block. These could be build around me Uncommons tempting drafters to play with Mechs. Did any of you see Tom LaPille talk about Modern Masters development during Day one World's coverage? Are we aiming for Grizzly Bears & Pegasus Charger, or Blind Phantasm & Wind Drake. That'll be the points value of our front side parts. What if instead of the graveyard, Parts that die go to the Scrap Pile (a new zone,) and can be combined from there? This makes removal less disruptive overall, helping us avoid the troubles Avacyn Restored had. And it prevents the usual Reanimation constraints on design. My favorite thing about this is the possibility that the Scrap Pile could be a shared zone, and players may have to fight over parts to transform. I don't think the ad card can be interchanged with a Magic card. I think they use different card stock; I remember seeing a question like that posed to Maro, although I can't be sure. I haven't found the Tom LaPille talk yet... Was it World Championship day one or the World Cup day one? A Wind Drake would be better than Pegasus Charger for the front side's power level. How does the Scrap Pile work? That is a crazy and interesting idea, especially if it's a post-apocalyptic world. I'm not sure that a new Zone should be used in conjunction with a DFC though. Where is M14 Sowing Seeds?